Location, location, location. Yes, The Surrey—New York City’s only Relais & Chateaux property—is utterly magnificent, but its location in a quiet Upper East Side residential neighborhood and just around the corner from the Whitney, not to mention steps away from Central Park and the best of Madison Avenue shopping, puts it over the top when it comes to Manhattan hotel stays. Even with 190 spacious and elegant salons, including 30 one-bedroom suites, guests here feel as if they’re staying in a posh New York City residence rather than a big hotel, and its status as the official VIP hotel for the Whitney Biennial only adds to its exclusivity. Complementing its prime location is the top-end service from the highly efficient staff and an ambiance that is never snobby or stuffy. It’s an idyllic setting for the truly well-heeled traveler who seeks out fabulous accommodations in one of the world’s greatest cities. The salons and suites, ranging from 350 sq. ft. to 2,127 sq. ft., are ultra-chic with Beaux-Arts—the building itself was built pre-war in Beaux-Arts architectural design—and Art Deco custom-designed furnishings as well as artwork that ranges from prints of 1700s etchings to contemporary B&W photos of New York scenes. Select salons feature fireplaces, private terraces and soaking tubs, while many suites include small kitchens, as well as those coveted terraces overlooking Manhattan—those views are enough to stir the soul of even the most jaded of travelers. Of course, because nothing but the best will do, guests will luxuriate in custom Duxiana beds, Pratesi bathrobes, Sferra linens and bath amenities by Laura Tonatto of Milan. 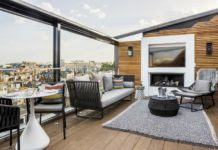 Clients with very deep pockets should book the loft-like Penthouse with 10-ft. ceilings, a wraparound terrace and direct access to The Surrey’s English Rooftop Garden. Kanagasingham says that a couple of the hotel’s most unique offerings include the in-room mixology program, “providing guests with the opportunity to learn how to prepare their favorite classic cocktail in their salon or suite. We also offer Post Pets,” she adds, “a program for guests traveling with their four-legged friends. It includes a Surrey monogrammed bed, all-natural Mac ‘n Cheese biscuits from Bocce’s Bakery,” and other treats. The hotel offers the 2-night East Side Revival package, with rates from $2,025. It includes accommodations in a Deluxe Salon with an upgrade to Grand Deluxe Salon (based on availability); 1-hour nutritional consultation and healthy restaurant recommendations from a local expert on nutrition; plus two Cornelia Spa Signature massage treatments and two detoxifying treatments.